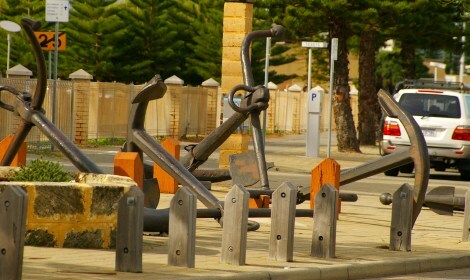 Fremantle, at the mouth of the Swan River was the first settlement* way back in 1829. It has always been a maritime town and the sea and its sailors are an inescapable part of the landscape. Over the years, as the rocks and shoals were discovered, many ships came to grief. 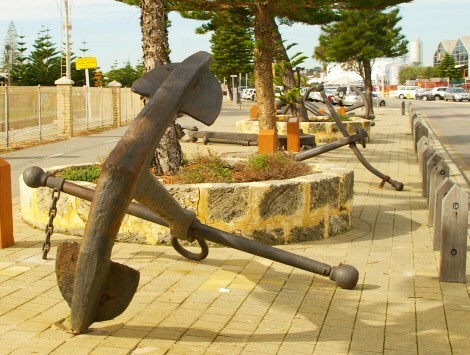 It does not seem out of place that along a street near the foreshore is a row of anchors which have been salvaged from some of those wrecks. That cross piece is called the stock. While the third one along is supposed to have a bent stock for stowage reasons, the one nearest the camera was straight. Until the storm which sank its ship. * I will write about Albany another day.